When it comes to clinical documentation, physician advisors have a range of important responsibilities, from query escalation to denials management and everything in between. With all these tasks on their plate, physician advisors are constantly pulled in different directions, making it hard to make the best use of their time. 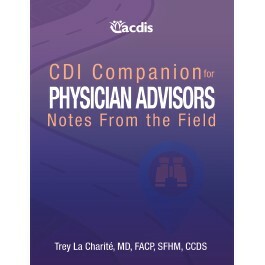 CDI Companion for Physician Advisors: Notes From the Field is designed to help physician advisors structure their time properly and carry out their CDI duties effectively and efficiently. Trey La Charité, MD, FACP, SFHM, CCDS, is a hospitalist with the University of Tennessee Medical Center (UTMC) and a past ACDIS Advisory Board member. He serves as the physician advisor for UTMC’s clinical documentation integrity program, coding, and Recovery Auditor response. La Charité is a regular contributor to CDI Journal, co-author of the Physician Advisor’s Guide to CDI, and a co-lead instructor for the popular Physician Advisor Boot Camp.